My startup Omnidrive first found oDesk when we needed to find contract C++ development skills to work on a project. At first look, it appears just like one of many other portals and marketplaces that assist project managers to find talent – but upon close inspection oDesk has distinct advantages that make it one of the best and easiest ways to find employee’s on-demand. 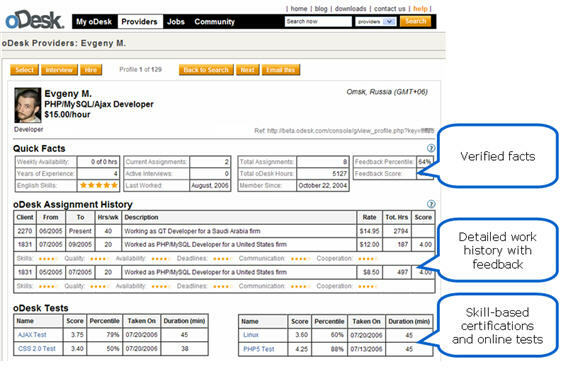 After 2 years in beta oDesk launched in May of this year as a marketplace for contract talent. We found that oDesk has a large number (3600 providers) of highly skilled individuals in a large number of categories, from document writing, Java development to C++ development. The process of finding a contractor was very simple, after we posted a job ad we received dozens of responses within days and Omnidrive had the position filled by a highly skilled team in India by the end of the week. The high quality of providers is on thing that oDesk holds above competition, but it really shines once you have selected a provider to work with. 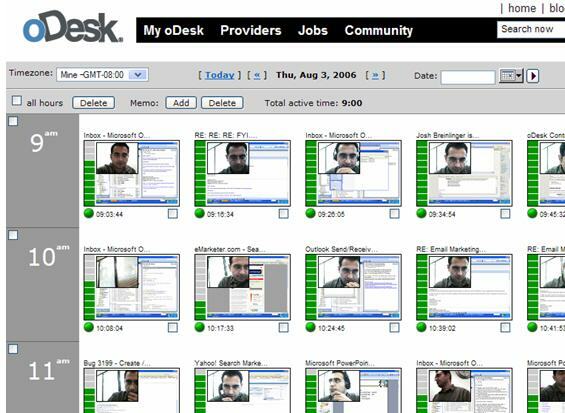 oDesk uses webcams and screen-capturing technology on the providers side to monitor the progress of work being done. The online contracting business has long had issues of distrust and the project management and monitoring technologies in oDesk certainly alleviate that. We were able to watch and communicate with our provider using a webcam, which solidified the relationship which was only days old. The providers are primarily from India, Russia, Ukraine, US, Philippines and Canada, and there are currently 255 job openings in the system. oDesk is also unique in that it doesn’t fix the cost of a project, instead charging an hourly rate, which allows the project manager to use the providers as required. For it’s part of the process, oDesk takes a commission on hours charges, and currently tens of thousands of hours are being charged out each month. oDesk is based in Menlo Park and they have raised $6M from Sigma Partners and Globespan. oDesk eats their own dog food, as 50% of their 40-strong team are oDesk providers, and they use their own project management system to build the platform. oDesk provides a simple, easy and safe option for sourcing and managing skilled contract labor.